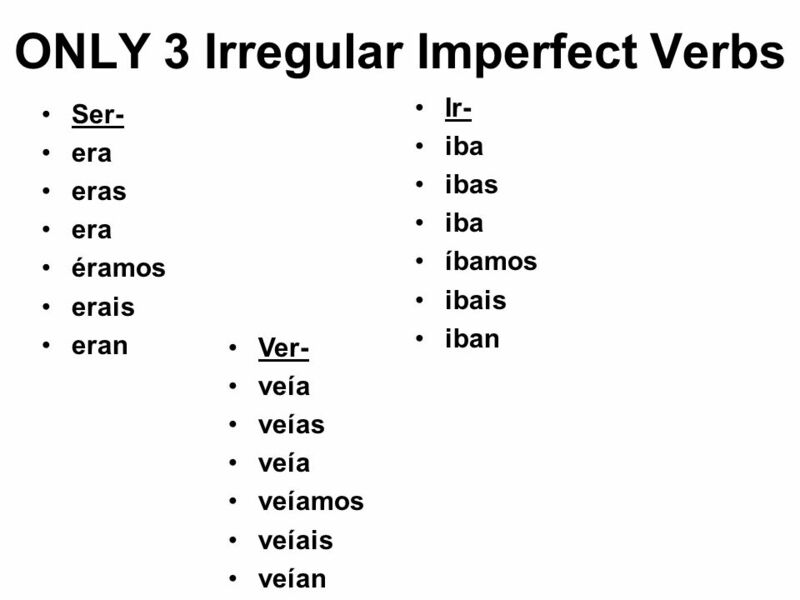 1 The Imperfect- El imperfecto …another way of talking about the past. 2 Remember this? 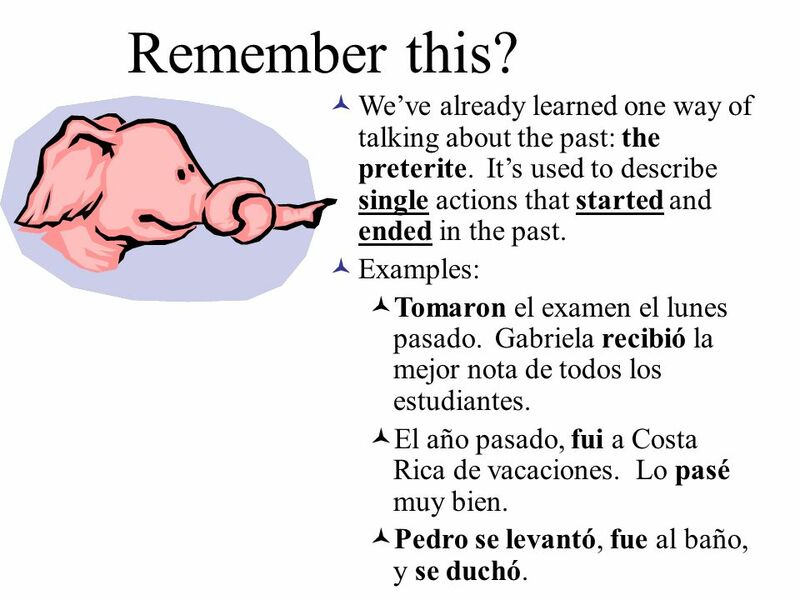 Weve already learned one way of talking about the past: the preterite. 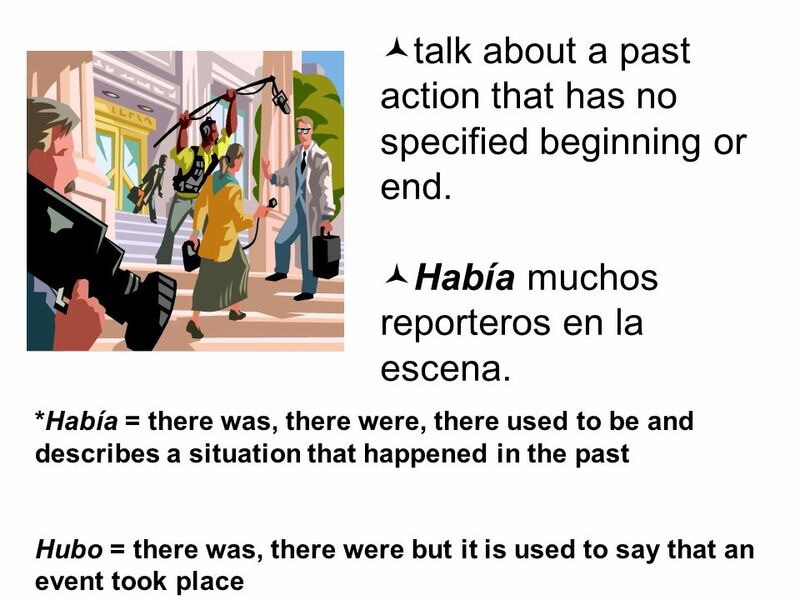 Its used to describe single actions that started and ended in the past. 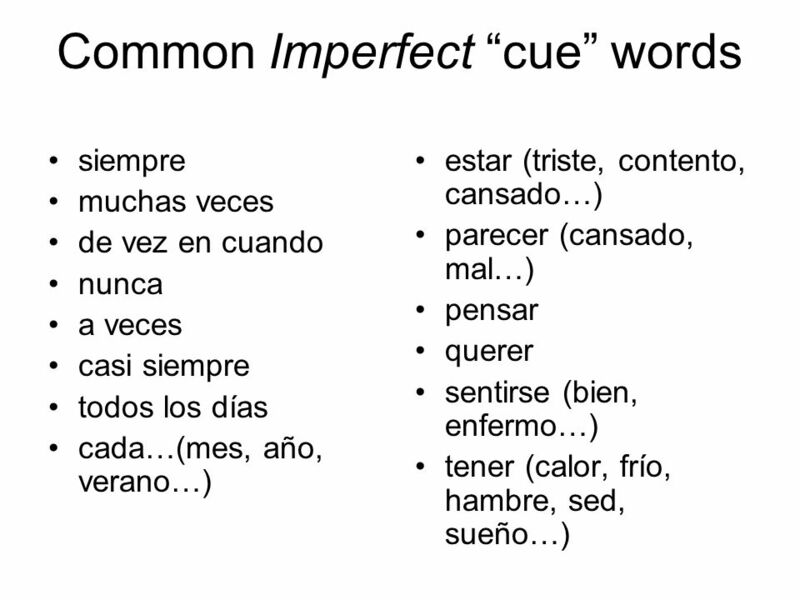 Examples: Tomaron el examen el lunes pasado. Gabriela recibió la mejor nota de todos los estudiantes. El año pasado, fui a Costa Rica de vacaciones. Lo pasé muy bien. Pedro se levantó, fue al baño, y se duchó. 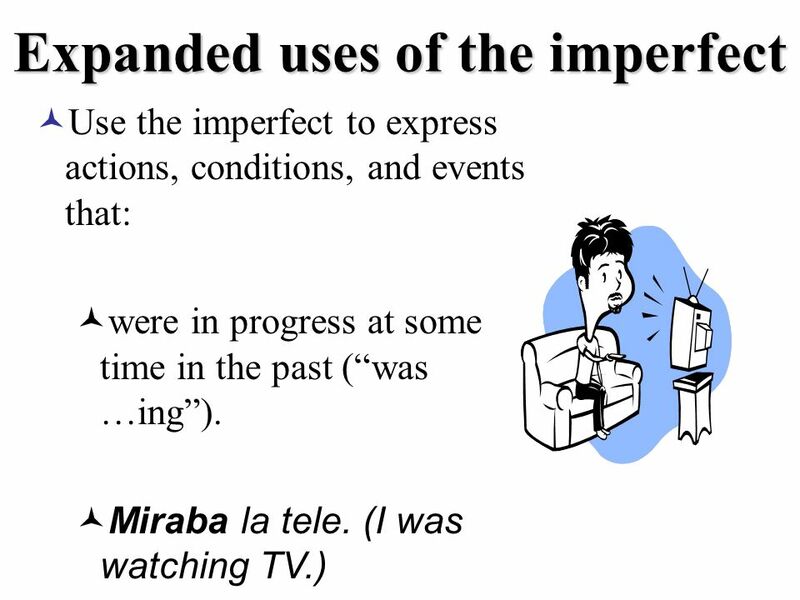 3 The Imperfect For… actions repeated in the past unfinished actions in the past descriptions about the past a different verb tense, called the imperfect. 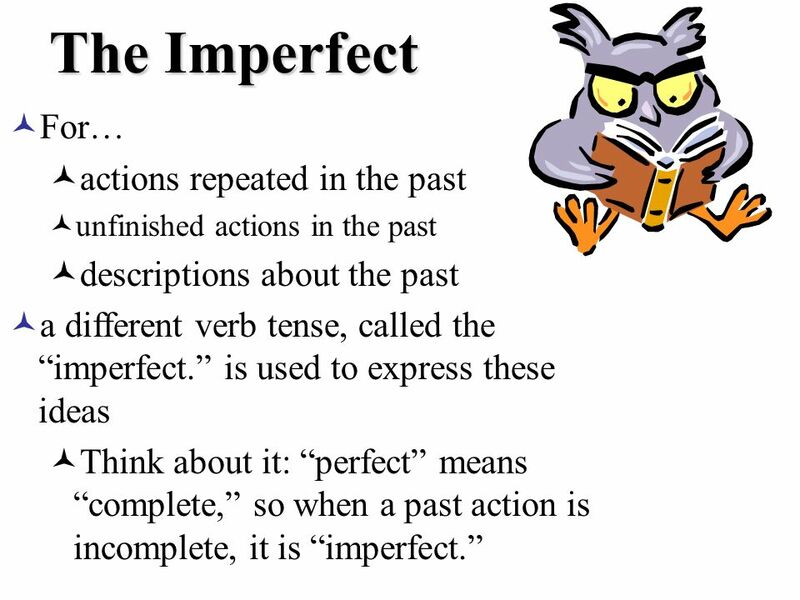 is used to express these ideas Think about it: perfect means complete, so when a past action is incomplete, it is imperfect. 5 occurred repeatedly in the past (used to or would). 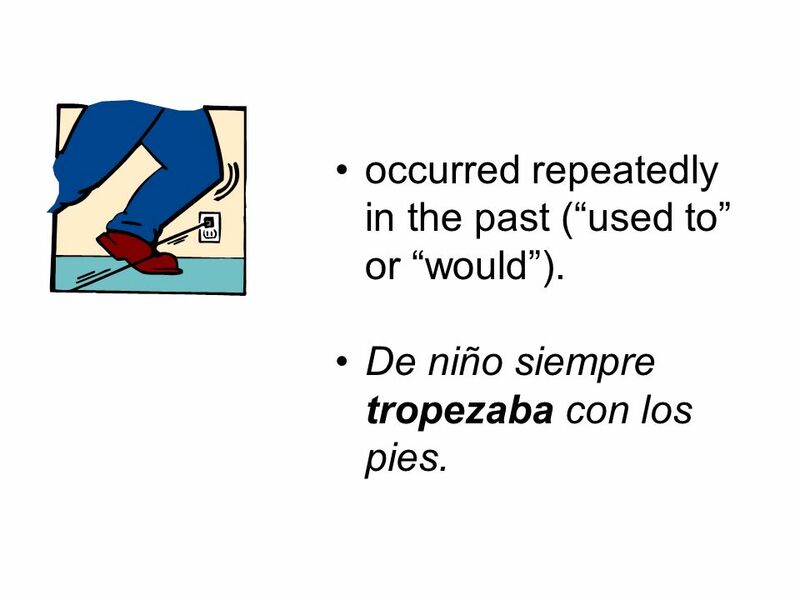 De niño siempre tropezaba con los pies. 6 were anticipated or planned (was going to). 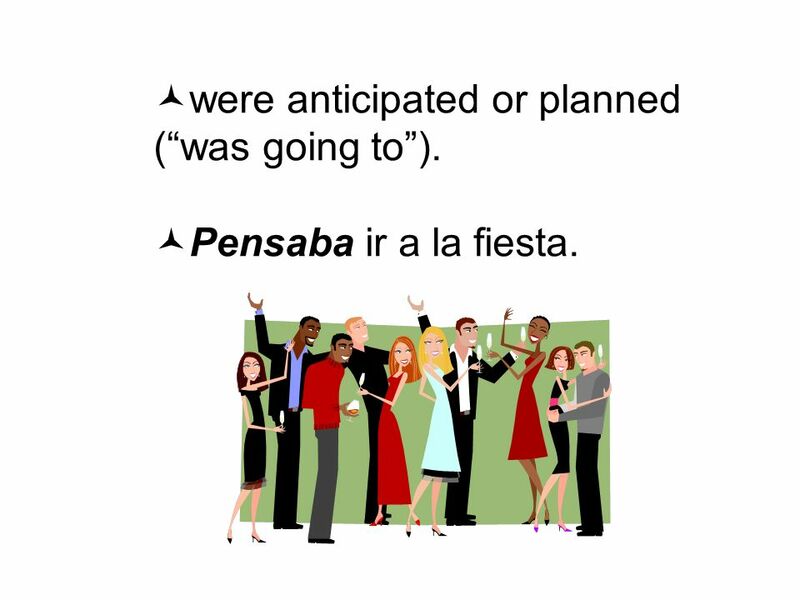 Pensaba ir a la fiesta. 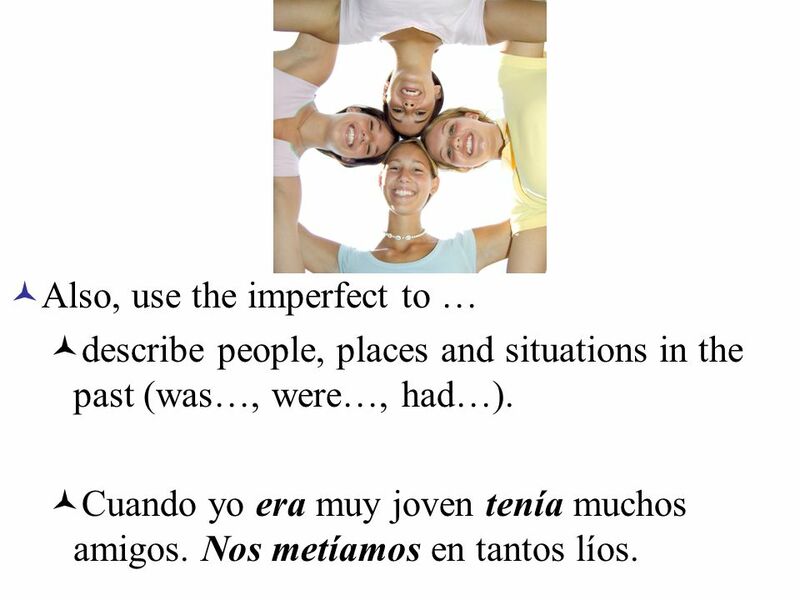 7 Also, use the imperfect to … describe people, places and situations in the past (was…, were…, had…). Cuando yo era muy joven tenía muchos amigos. Nos metíamos en tantos líos. 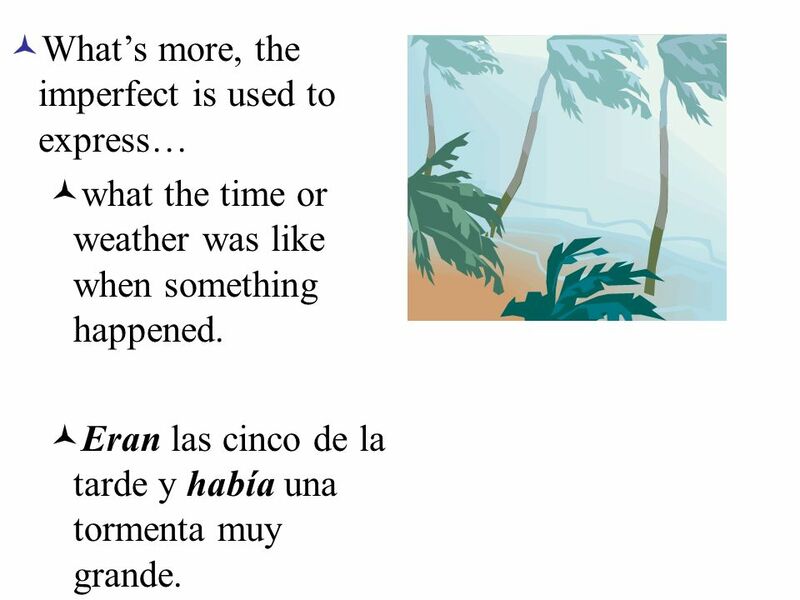 10 Whats more, the imperfect is used to express… what the time or weather was like when something happened. Eran las cinco de la tarde y había una tormenta muy grande. 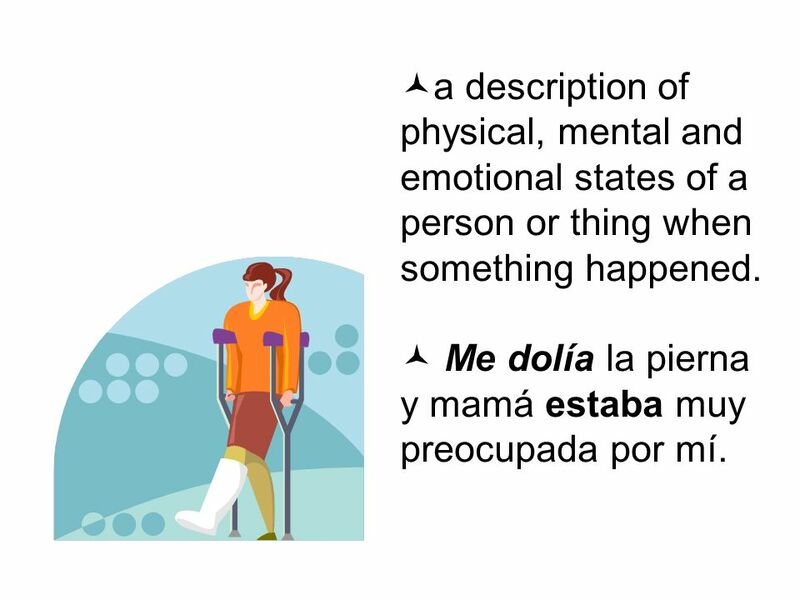 11 a description of physical, mental and emotional states of a person or thing when something happened. Me dolía la pierna y mamá estaba muy preocupada por mí. 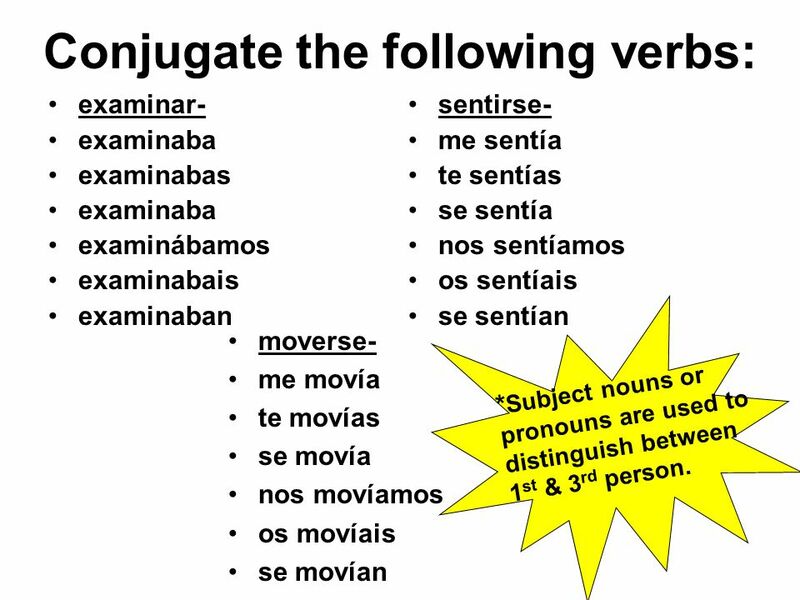 14 Conjugate the following verbs: examinar- examinaba examinabas examinaba examinábamos examinabais examinaban sentirse- me sentía te sentías se sentía nos sentíamos os sentíais se sentían moverse- me movía te movías se movía nos movíamos os movíais se movían * Subject nouns or pronouns are used to distinguish between 1 st & 3 rd person. 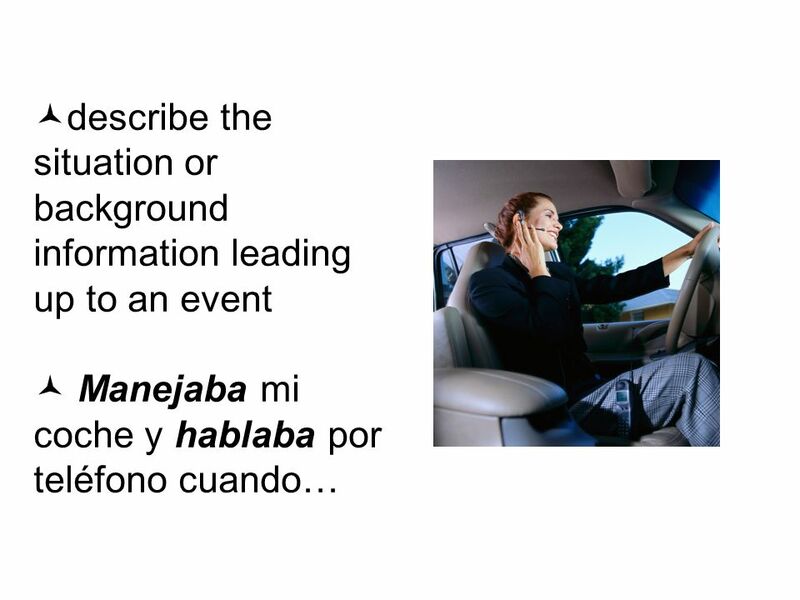 16 Write the following in Spanish. 1.It was 11:00 in the morning. 2.It was very hot and sunny. 3.Sue and her boyfriend, Ted, were walking in the park. 4.He was very tall, dark and handsome. 5.Sue was (felt) quite nervious, but happy. 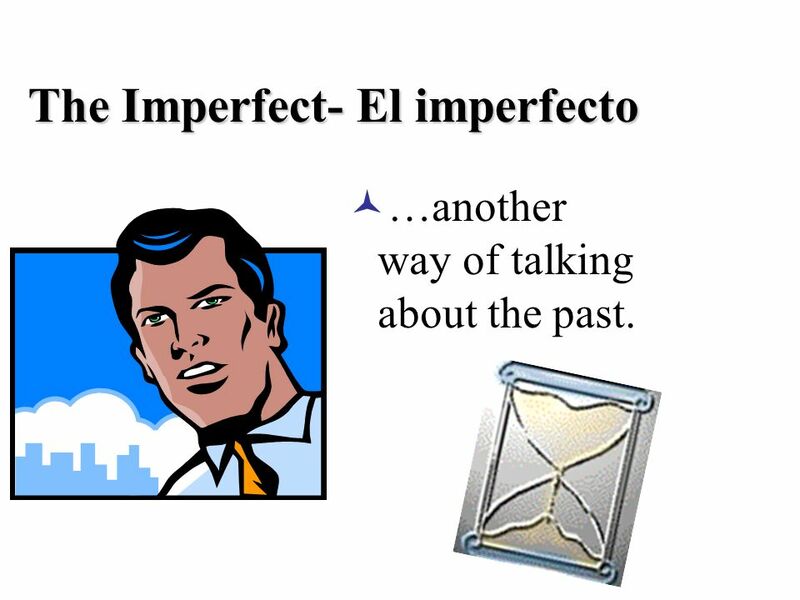 Descargar ppt "The Imperfect- El imperfecto …another way of talking about the past." 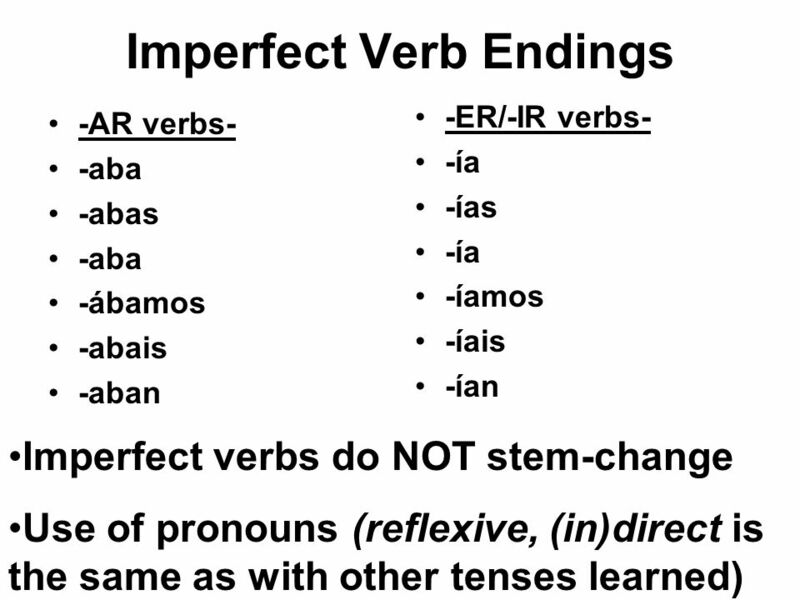 El imperfecto Apuntes de gramática The Imperfect In this presentation, we will look at another way of talking about the past.